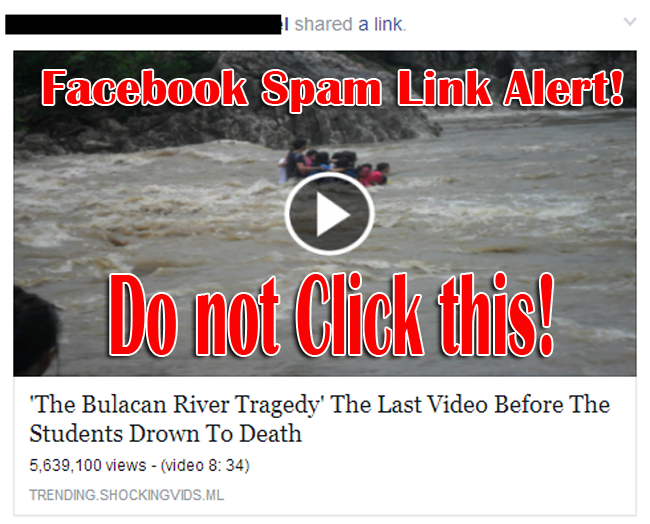 Spam Link Alert: Another Virus Spam Link was spotted circulating on Facebook Timeline captions 'The Bulacan River Tragedy' The Last Video Before The Students Drown To Death. This would be shared by one of your Facebook friends who click on that virus infected link that automatically used their Facebook account to share the link to their own timeline. Do not click on the link. If you happen to see a shared link pertaining to a video of 'The Bulacan River Tragedy' via Facebook, the best thing to do is to report the link as spam to stop the spread. Be vigilant and avoid this type spam link on Facebook. See the scree-grab of shared spam link about 'the Bulacan River Tragedy' below. If you clicked the virus spam link you will be redirected to the phishing website and you'll automatically spread of the same virus spam link that continues with your Facebook account. 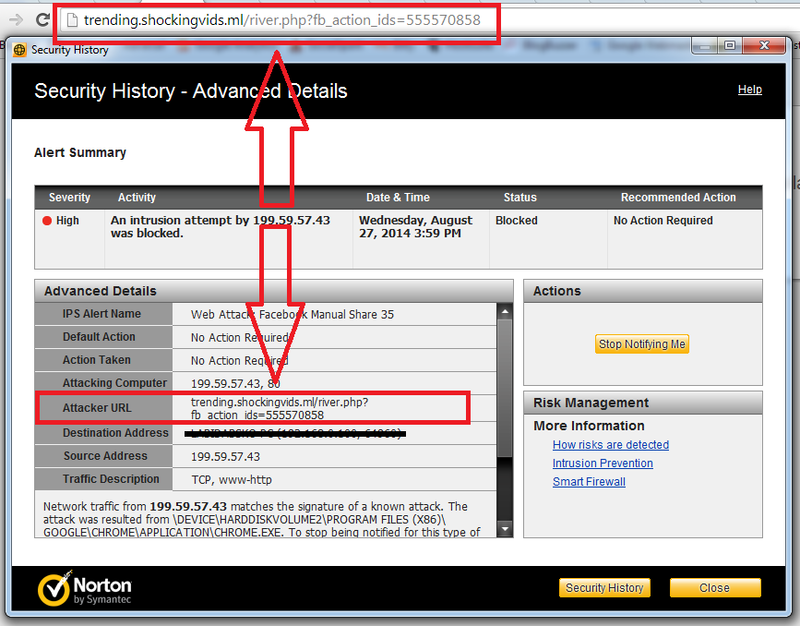 Facebook Spam Link about 'The Bulacan River Tragedy' was detected as Facebook Manual Share 35 by Norton Anti Virus, see the image shown below. Please be informed that there was no actual video taken during the 'The Bulacan Field Trip Tragedy'. Read the BSU Field Trip Accident due to Flash Floods: Story and News Updates on Death Toll and Survivors here. Only Last Photos of BSU Students Before Drowning on Field Trip Tragedy last August 19, 2014 were available. Previously, Another Spam Link was spotted circulating on Facebook Message captions "In this video belong to you, Click for watch video'. This message would be sent by one of your Facebook friends is infected with virus video link on Facebook. The message has been circulated to many Facebook users in the Philippines and other countries via their Facebook Inbox or Messenger since Monday. This catchy trick had in fact tricked many users into believing that the video is really meant for them, and eventually clicking on the dangerous link that will spread also on their Facebook friends’ inbox without authorization. Inform your friends about this link and help them to avoid the spam. Be updated in all possible spam link alert, follow us on Facebook and Twitter now.